If y'all started, through about, or even considered this year's Documented Life Project in the Dylusions journal, y'all may have (if you're like me) counted all of the pages to make sure there were indeed enough pages to do 52 two page spreads. There were enough pages to be certain with twelve pages left over! I have "messed up" two pages within my DLP pages that I kept in there as just plain ol' journal pages but I still have quite a few blank pages! 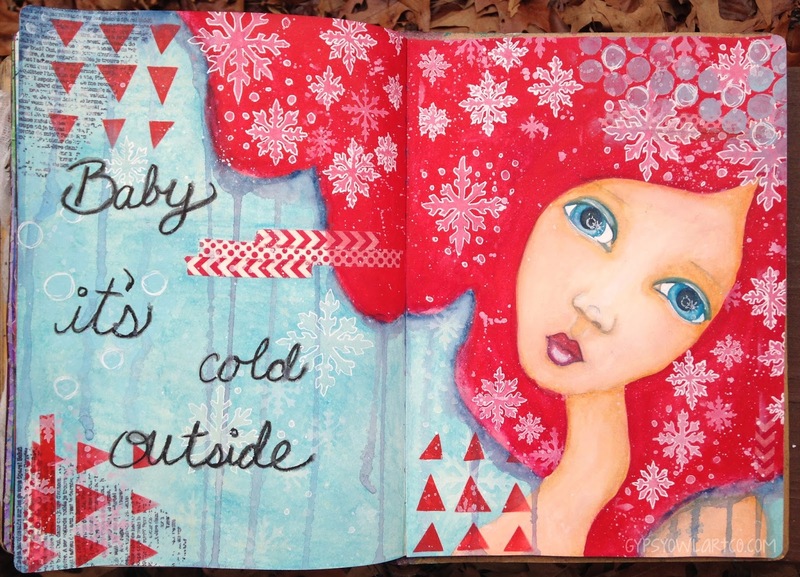 Just for fun - and so I can say that I filled up the ENTIRE journal in 2015 I am working on these last pages! This page here is one of them. I started by drawing a whimsical little lady and coloring her using my Neocolor II's. The background is also colored with a turquoise Neocolor II. I added a few bits here and there with Dylusions paint through a handmade stencil (the triangles) and the Let it Snow stencils (both sizes) by Dylusions. Now mind you... the high in central Mississippi is supposed to reach 81 today. Baby it ain't cold here! But I would love to pretend it was cold and that we'd actually get a white Christmas. And this is one of my all time favorite Christmas songs! I hope as you're gathered with your families tonight and tomorrow that y'all have a wonderful day with wonderful food, lots of love, hugs a-plenty, and more smiles than you can stand.